What kind of Christianity are they teaching at Liberty University? Speaking about the Dec. 3 shooting in San Bernardino, Ca., Liberty University President Jerry Falwell, Jr. suggested Friday that more students, staff and faculty get permits to carry concealed weapons. Within a day, dozens of people had already begun the process of obtaining permits to carry guns on campus. “I’ve always thought that if more good people had concealed-carry permits, then we could end those Muslims before they walked in,” he said, as applause drowned him out. It’s clear by the context he was speaking about the Dec. 3 shooters, and not all members of the Islamic faith. 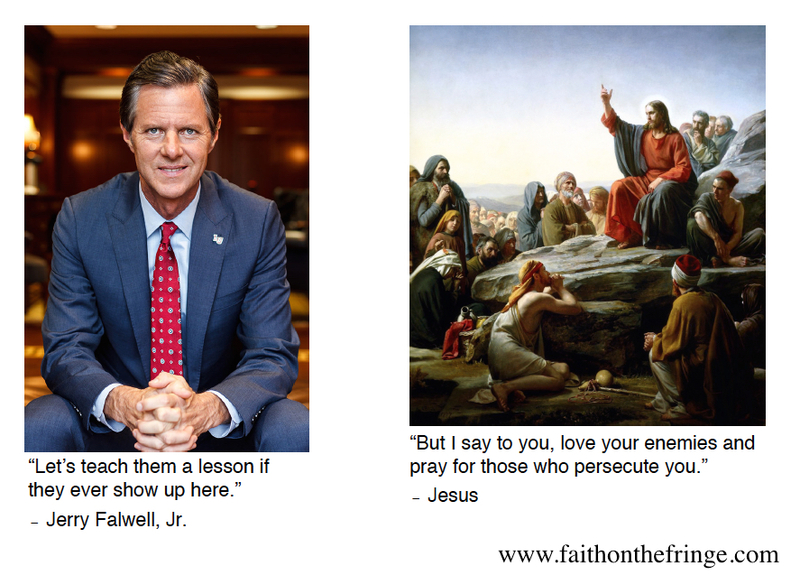 “Let’s teach them a lesson if they ever show up here,” Falwell told the students. The problem isn’t Falwell’s seemingly anti-Muslim position. The problem is his clearly unChristian stance. In Luke, Jesus tells his disciples to buy a sword, but even the co-founder of Liberty University doesn’t believe Jesus intended his followers to use a literal sword violently. To be a Christian, a follower of Jesus, means to respond like Jesus, right? Jesus tells us to pray for the Dec. 3 shooters, and their orphaned child. And Jesus tells us to not be afraid. Why do people carry guns? Because they are afraid they will be confronted by someone with a gun. Speaking to the students, Falwell implied that he had a gun in his pocket on stage. He spoke more about guns than he did Jesus, or love, or kindness. I understand the context of what he was saying, and the possibility he might have offered prayers earlier, but the fact remains, you can’t talk shooting people while you’re following Jesus. It just doesn’t work that way. Scripture is clear. Jesus is clear. The life and example of Jesus are crystal clear. Liberty students have a much better chance of accidentally discharging guns or using them in domestic disputes than they do ever stopping a mass shooter. It’s fearful and irrational to believe that concealed guns are a Christian response. But what about defending ourselves, or our families, you may ask? What’s Jesus’ response? To fight back, or to allow himself to be hit again? Do we curse those who attack us, or pray for them? Do we pull out a weapon, or do we love them like God loves us? What kind of Christianity are they teaching at Liberty University? Because it certainly isn’t the message of Jesus and it isn’t in the Bible. This entry was posted in Faith, in the news and tagged Bible, Jerry Falwell, Jesus, Jr., Liberty Uinversity, Matt 10:34. Bookmark the permalink. 3 Responses to What kind of Christianity are they teaching at Liberty University? This is a well written article standing on the Rock of Christ. I pray those who need to hear it’s deeper message will not get self-defensive and entrench themselves in their unChrist-like attitudes. but look on this issue with more Christly vision. Some trust in horses. Some trust in chariots. [Some trust in guns] We will trust in the Lord our God. It appears that most Christians, like the words but have no intention of following Christ’s words. Years back, there was a phrase; “you couldn’t just talk the talk, you had to walk the walk” , or it was just a performance.